The series will not return for a second season. 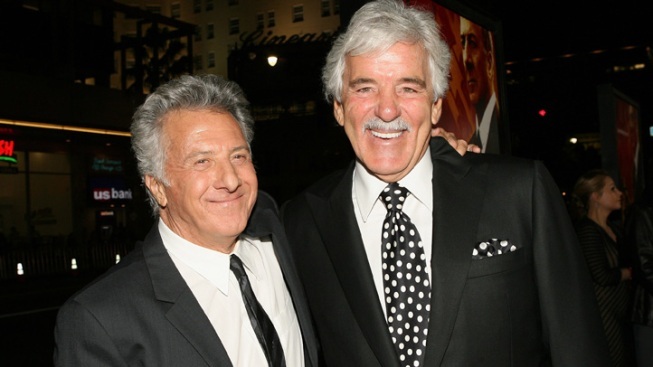 "Luck" stars Dustin Hoffman and Dennis Farina at the Los Angeles premiere in January. The horseracing series "Luck" was canceled by HBO after a third thoroughbred died during production of the drama starring Dustin Hoffman and Nick Nolte, the channel said Wednesday. "Luck," about the seedier side of racing, will air the final two episodes of its first season now in progress, HBO said. But the series won't return for the second season that began production last month, it said. "While we maintained the highest safety standards possible, accidents unfortunately happen and it is impossible to guarantee they won't in the future," the channel said. "Accordingly, we have reached this difficult decision." The move was made with David Milch, the show's creator, and Michael Mann, his fellow executive producer on the drama that brought film actor Hoffman to series TV. It was a high-profile project for the premium channel that stakes its reputation on such fare. Retired jockey Gary Stevens, who co-stars on "Luck" and was in the racehorse movie "Seabiscuit," tweeted his support to the HBO series: "So bummed. Peace out to all my family in (hash)luck." The American Humane Association, which oversees animal welfare on Hollywood productions, said that in light of the three deaths "this is arguably the best decision HBO could have made." The group said it will work with HBO to ensure that horses used on "Luck" are "retired properly." People for the Ethical Treatment of Animals, which had been sharply critical of the production, welcomed the cancellation and offered advice to HBO and the producers if they decide to resume it. "PETA will be calling on them, as we have done from the start, to use stock racing footage instead of endangering horses for entertainment purposes," the group said in a statement. On Tuesday, a horse was injured and euthanized at Santa Anita Park racetrack, and HBO agreed to suspend filming with the animals after the American Humane Association issued an immediate demand "that all production involving horses shut down" pending an investigation. During season-one filming in 2010 and 2011, two horses were hurt during racing scenes and euthanized. HBO defended its treatment of the animals, saying it's worked with the humane association and racing industry experts to implement safety protocols that exceed film and TV industry standards. The humane association had called for a production halt at Santa Anita after the second horse's death. Racing resumed after new protocols were put in place and proved effective, Karen Rosa, the AHA unit's senior vice president, said in February. When the horse was injured, an attending veterinarian determined that euthanasia was appropriate, he said. The necropsy and toxicology testing will be done despite the show's cancellation, the board said. The first two horse deaths drew criticism from PETA, which said that safety guidelines used in filming failed to prevent the deaths "so clearly they were inadequate."